My grandfather was caramel-skinned with black eyes and thick, dark hair, and until he discovered that he was adopted, he had no reason to suspect that he was not the son of two poor Mexicans as he’d always been told. When he found his adoption papers, according to family lore, he pestered the nuns at the Dallas, Texas orphanage where he had lived as an infant for the name of his birth mother. Name in hand, at 10 years old, he hopped a bus to Pennsylvania, met his birth mother, and found out that he was actually Syrian. At least that’s what we thought until my Aunt Cat mailed a tube of her spit in to AncestryDNA. 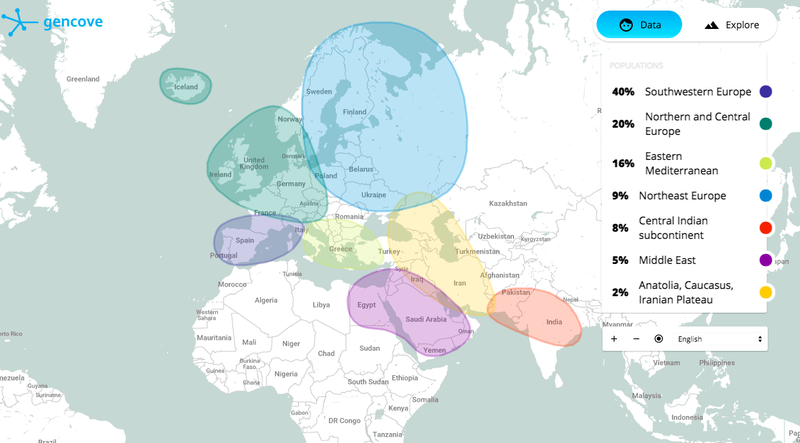 Genetic testing suggested that my aunt’s genetic makeup was only a tiny bit Middle Eastern—16 per cent, not the 50 per cent you might expect if your father was a full-blooded Syrian, as my grandfather believed himself to be. The rest of her Ancestry breakdown provided some explanation, but mostly more confusion. 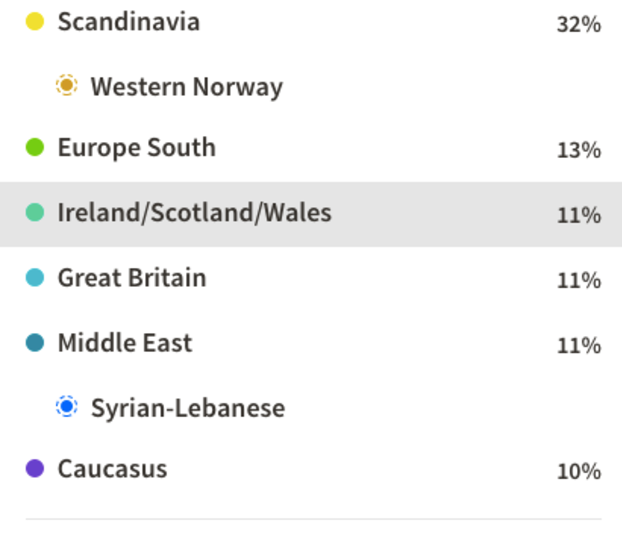 While we typically think of the Caucasus as countries on the Black and Caspian seas like Turkey and Armenia, Ancestry’s test also said it includes Syria. According to Ancestry, the Caucasus accounted for another 15 per cent of my Aunt Cat’s DNA. What about the other 20 per cent? One line-item stood out as something my aunt hadn’t expected, based on what she knew about either of her parents: She was 30 per cent Italian-Greek. My mother’s test revealed similar results. This caused a minor family scandal. My grandfather’s mother was born in Pennsylvania, but she had lived in an insular Syrian community that never really assimilated. She became pregnant as a teen by her father’s best friend. The assumption had always been that he was Syrian, too. If we weren’t who we thought we were, well, then, who were we? “I guess we never knew the name of Dad’s father,” my aunt told me, bemused. Suddenly it seemed as though all along we had been missing a gigantic puzzle piece of information about our family tree. At least, my aunt quipped, this was a solid explanation for why she loved pasta. If we weren’t who we thought we were, well, then, who were we? It’s right there in the fine print of any consumer DNA test, if you bother to read it: DNA testing can come with identity-disrupting surprises, be it an unexpected relative, genetic condition, or, in our case, heritage. But something about this particular surprise didn’t feel quite right. My Aunt Cat is our family’s amateur genealogist, and she has logged hundreds of hours both on Ancestry.com and in my grandmother’s attic, piecing together the story of our family tree. She’s found countless third, fourth, and fifth cousins with ties to Syria, but no one from either Italy or Greece. In her twenties, she even visited my grandfather’s biological mother and aunt. She recalled them passing around a hookah, yelling in Arabic, and expressing repulsion at the American-style cold cut platter served at a community function. Given how segregated the family was, it seemed like a stretch, she told me, to imagine that anyone had ever had so much as a friendly conversation with an Italian. I suspected the error might lay not in my family narrative, but in the DNA test itself. So I decided to conduct an experiment. I mailed my own spit samples to AncestryDNA, as well as to 23andMe and National Geographic. For each test I got back, the story of my genetic heritage was different—in some cases, wildly so. The author’s DNA test results from AncestryDNA. My AncestryDNA test revealed that I, too, had geographic roots in the Middle East, the Caucasus, and Southern Europe, along with the expected big dose of Scandinavian from my very Norwegian father. Weirdly, though, my percentages of Middle Eastern and Caucasus were almost as high as my mom and aunt’s, though you would expect them to be closer to half. It got more confusing from there. My test through National Geographic (which partners with the DNA sequencing company Helix for its test) gave me even more links to the Middle East, with 16 per cent of my DNA from Asia Minor, 6 per cent from the Persian Gulf and 9 per cent something called “Jewish Diaspora.” Unlike AncestryDNA, National Geographic’s test assigns your heritage to broad regions instead of modern nation-states. But I could infer that, according to National Geographic, I was less Scandinavian based on my percentage of Northwestern European. I was also more Southern European and, for fun, now had a good chunk of Eastern European thrown in there, too. The author’s DNA test results from National Geographic. 23andMe’s ancestry results were the most confounding of all. It found that I was only 3 per cent Scandanavian, a number that, based on my recent family history, I know is flatly wrong. It also found I was only 5.5 per cent Middle Eastern and a whopping 62.6 per cent Northwestern European. And no Eastern European at all. 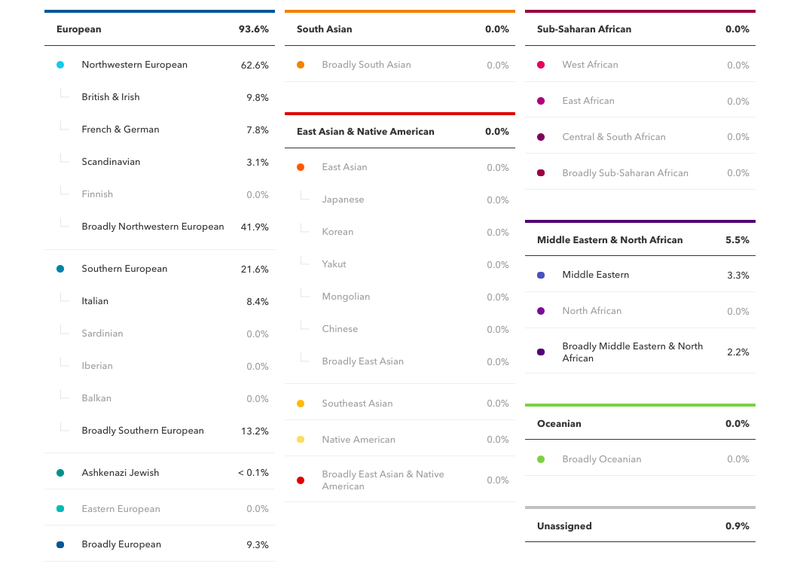 The author’s DNA test results from 23andMe. I also uploaded my 23andMe data to GenCove, a small ancestry-test startup founded by scientists. Based on the exact same data that 23andMe had crunched, GenCove reported that 8 per cent of my DNA was from the Indian subcontinent. 23andMe had found I had no South Asian DNA at all. 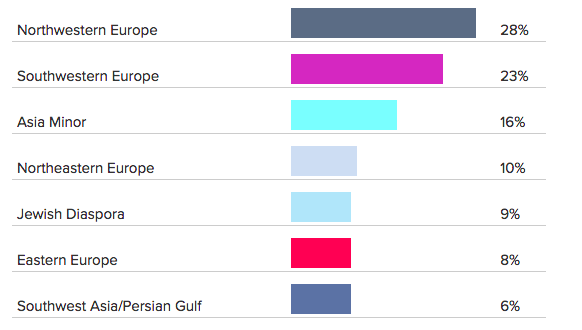 The author’s DNA test results from GenCove, using 23andMe data. Four tests, four very different answers about where my DNA comes from—including some results that contradicted family history I felt confident was fact. What gives? There are a few different factors at play here. Genetics is inherently a comparative science: Data about your genes is determined by comparing them to the genes of other people. As Adam Rutherford, a British geneticist and author of the excellent book A Brief History of Everyone Who Ever Lived, explained to me, we’ve got a fundamental misunderstanding of what an ancestry DNA test even does. Ancestry, for example, had determined that my Aunt Cat was 30 per cent Italian by comparing her genes to other people in its database of more than four million people, and finding presumably that her genes had a lot of things in common with the present-day people of Italy. Heritage DNA tests are more accurate for some groups of people than others, depending how many people with similar DNA to yours have already taken their test. Ancestry and 23andMe have actually both published papers about how their statistical modelling works. That the data sets are primarily made up of paying customers also skews demographics. If there’s only a small number of Middle Eastern DNA samples that your DNA has been matched against, it’s less likely you’ll get a strong Middle Eastern match. As a person of Syrian descent, the British genealogist Debbie Kennett told me, my test was simply not going to be as accurate as fellow Americans whose relatives skew more European. “The tests are mainly geared for an American audience, and they tend to not have a lot of Middle Eastern ancestry,” she said. Likewise, Kennett said, because relatively few English people have taken tests from American companies like Ancestry or 23andMe, residents of the UK are likely to find less useful results. Another anecdote that stuck with me came from my friend Alexis Madrigal. Initially, he said, his Mexican family came up as Arab North African, which was surprising. As 23andMe refined its test and its data set grew, it also refined the results: Now, he was descended from Jewish people from Southern Europe. The number of Madrigals in central Spain had long led the family to suspect that their migratory path to Mexico had at some point passed through this region. As more people took the test, the picture of where his family was “from” changed. The Canadian bioethicist Timothy Caulfield shared a similar story. At first a DNA test revealed he was entirely Irish, but as the data set changed, he gradually became less Irish. When we talk about “ancestry,” we also don’t always mean the same thing. Ancestry just implies people you’re descended from. But when? In America, we often mean whenever our relatives came to the US. On my dad’s side, I expected to see a lot of Scandinavian, because just a few generations ago my great grandparents came from Norway to North Dakota. On my mum’s side, my grandmother has a relative that came to America on the Mayflower. Both are what come to mind when I think of my “ancestors,” but they are separated by several generations and hundreds of years in time. Rutherford pointed out that if we went 500 years back, my ancestors were probably from all over Europe. “You and I are probably fifth cousins,” he said. Where your ancestors are from depends on what period in time you’re talking about. Why don’t I instead say I’m 50 per cent North Dakotan and 50 per cent Texan? Tests also differ from one another because they’re simply looking at different things. The results of ancestry tests aren’t based on a reading of your whole genome. The vast majority of every human’s DNA is identical to any other human’s. Ancestry tests look at SNPs, the places on your genome where an individual letter tends to differ between people and give us insight into characteristics like disease, ancestry, and physical appearance. When an SNP occurs within a gene, then, in science-speak, that gene has more than one allele, or alternate forms of a gene that exist in the exact same place on a chromosome. To make matters more confusing, some tests look at mitochondrial and Y chromosome DNA, while others don’t. The CEO of GenCove, the company where I had uploaded my 23andMe data to get drastically different results, told me that even though he expects a fair amount of variability between algorithms, even he was surprised at how differently his company and 23andMe had interpreted my DNA data. He asked me to also upload my Ancestry data, and ran both data sets again after GenCove’s algorithm had been updated. The results were all over the map. “To be honest I’m a little confused about what’s going on,” CEO Joseph Pickrell told me. Each testing company is looking at different alleles from different parts of the genome, and using different algorithms to crunch that data. (You can see a list of how company tests differ here.) It’s worth mentioning that genetics is also probabilistic: just because you have the gene, doesn’t mean you have the trait. And sometimes, the algorithms might just get it wrong. Rutherford told me his 23andMe test came back with a tiny amount of Native American DNA. The finding actually linked up with one anecdote from his family lore, about a relative of his father’s that was a Native American tribesman and horse jumper in a British travelling circus. “As a geneticist, I am absolutely convinced that they’re not related,” he told me. “It’s just statistical noise that happens to coincide with this cool story.” Statistically, it’s unlikely that such tiny amount of Native American DNA would have been enough to show up on Rutherford’s test. A big problem is that many of us have a basic misunderstanding of what exactly we’re reading when Ancestry or 23andMe or National Geographic sends us colourful infographics about how British or Irish or Scandinavian we are. It’s not that the science is bad. It’s that it’s inherently imperfect, an estimation based on how much our DNA matches up with people in other places around the world, in a world where people have been mixing and matching and getting it on since the beginning of human history. Nearly everyone I interviewed for this story said that, taken with the right mindset, ancestry DNA testing can be fun. As more people take DNA tests and company data sets grow, the results from those tests will also become more detailed and accurate. Anecdotally, I saw this in my own results. Ancestry has the biggest DNA database, and its interpretation of my DNA was also most in-line with what I expected. But consumer genetic testing companies have also fuelled the misunderstanding of their products, suggesting that those colourful results reveal something profound about what makes you, you. Take this AncestryDNA advert about Kyle Merker, who, the advert explains, grew up German, wearing a lederhosen and performing traditional German dances. Then an AncestryDNA test revealed he was actually Scottish and Irish. He bought a kilt. Ancestry.com is suggesting—quite heavy-handedly—that your DNA can define your identity. A few changes to those As, Gs, Ts, and Cs, and all of a sudden you’re Riverdancing. In truth, your specific ancestors actually have relatively little impact on your DNA. Some 99.99 per cent of your DNA is identical to every other human’s. We’re mostly just all the same. But instead of embracing our genetic similarities, we cling to those differences as symbols of what makes us unique. Consumer DNA testing tends to reinforce that—even though the difference that one test reveals might not even exist in another. Your DNA is only part of what determines who you are, even if the analysis of it is correct. Plenty of people love pasta, with or without Italian DNA. If the messaging of consumer DNA companies more accurately reflected the science, though, it might be a lot less compelling: Spit in a tube and find out where on the planet it’s statistically probable that you share ancestry with today. 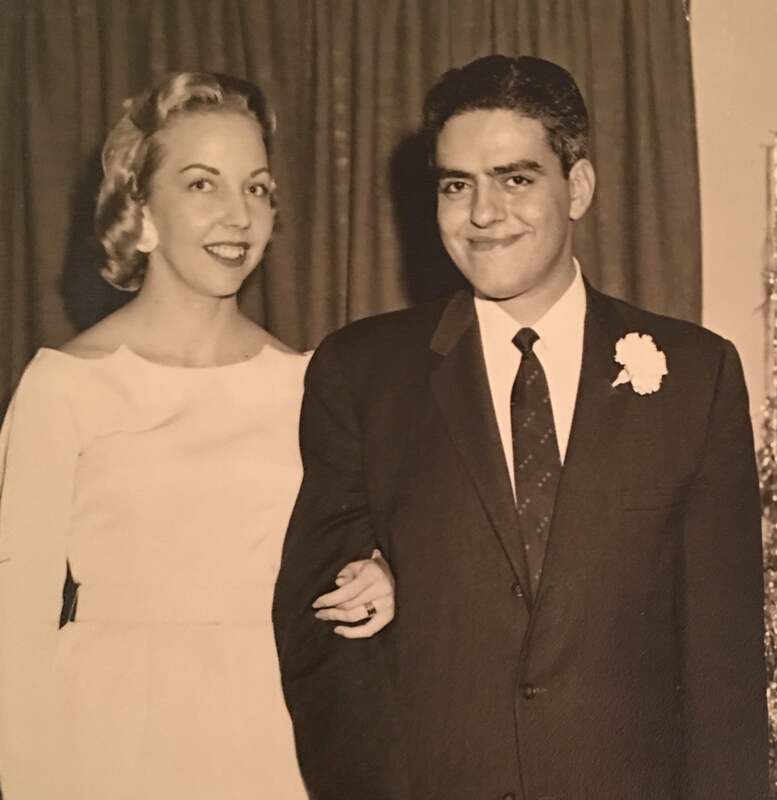 Learning he was Syrian did not seem to impact my grandfather’s identity as a Mexican man. And how could it? His life story was the story of so many children of immigrants. His father, Manuel, had swum the Rio Grande from Mexico to America in hopes of a better future. He worked as a waiter, and my great-grandmother as a seamstress. At age 10, my grandfather was sent to work at a Coca-Cola bottling plant to help the family make ends meet. He lost a finger. Eventually, he met my blonde-haired, blue-eyed grandmother and moved to California, hoping to raise their children somewhere it would matter less that one of their parents spoke Spanish as a first language. But me, I don’t even look the part. I’m fair with blue eyes. As a kid, I remember wincing when my friend’s mom made xenophobic comments directed at Mexicans, never suspecting her daughter’s fair friend had some Mexican ties, even if they were not by blood but by heart. As an adult, I learned Arabic and perfected my tamale-making, all in search of some sort of an identity fit. When my grandfather was dying, I struggled with the relationship between DNA and cultural identity. I wondered what would become of my Mexican heritage, once my last living link to it was gone. In the end, I finally found the same wisdom my grandfather never seemed to question. Sometimes your heritage doesn’t have anything at all to do with your genetics—and I didn’t even have to spit in a test tube to figure it out.